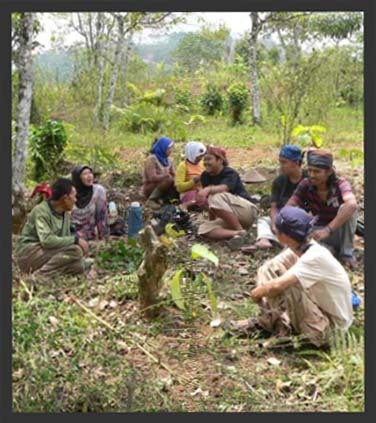 A few months ago, Forest Watch Indonesia (FWI) has been connected with an indigenous group who manage their customary territory in the Southern Banten, namely Kasepuhan Ciptagelar. 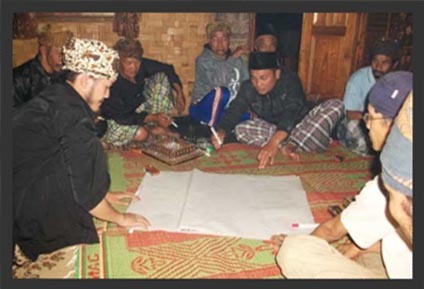 In essence, Kasepuhan Ciptagelar asks FWI’s assistance to document and map out their customary land. However, ability to work with map (in FWI) yet stills not enough to facilitate participatory mapping process. In order to do that, FWI ask JKPP (a network for participatory mapping) to assist on the processes. As we agreed before, in mid September 4 FWI’s and 1 JKPP’s staffs heading to Ciptagelar and to initiate the process of documentation and mapping the customary land. At this time, actually there is a tight ritual periods in Ciptagelar. Usually the people of Ciptagelar conduct several family events for about 90 days following Seren Taun celebration at the end of August. But we heard this year is different, as the period of events being shortened within 14 days only. This is happened because seed and rice-fields preparation must be conducted earlier. When we came, we saw a lot of visitors come into the Imah Gede, to see Abah Ugi, the chief of Kasepuhan Ciptagelar. The situation has made us waiting to have a meeting Abah Ugi for two days. While we wait, we spent our time to walk around and talk to peoples there. We visited their land to talk with farmers. We talked with children on their way home from school. We also visited them in their house. Nothing was serious in our conversation with them. Weather, daily-life and the situation with their farming activities is the usual topic. But, through this one, we call it first lesson on how to get basic information of social and economic situation from the first-hand source. One night, a few minutes pass 10 pm, we got into Imah Gede to say hello to Abah Ugi and start the discussion about our plans. Surprisingly, it was not just Abah Ugi there. Baris Kolot (The Elders) were also there for us. It seems that Abah Ugi has prepared this meeting for us. No time to be wasted, we started the session and soon we get into “a mental mapping” session. It is the session to document natural signs or boundaries based on Baris Kolot knowledge and memories. We wrote down a list of important places, and then we put each of them on a piece of paper. There were rivers, mountains or hills, valleys, and every recognisable place. Almost 2 am, finally we were done with our second lesson. On the next day, we train some young people there to use GPS (Global Positioning System) and document some coordinates around the Imah Gede area. Then we discussed about what we will do next after those coordinates have been collected. So, our third lesson came to an end as we drew a scalable map. In the next few hours, we sat somewhere else, ready to have some foods. All of us invited to the celebration of Abah family for a pair of leuit (paddy barns) they have built. Mapping activities will be conducted in mid October 2012, as being agreed between us and the Baris Kolot. This will be a continuation of unfinished mapping work by other previous mapping team. 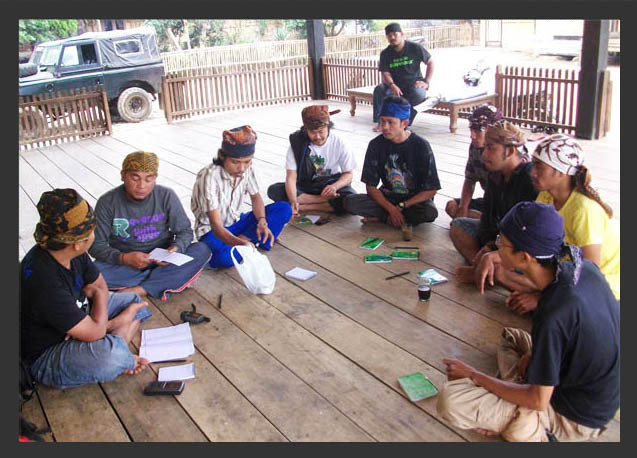 After this, we will then map the customary forest groups: leuweung titipan, leuweung tutupan, and leuweung garapan. It is a long road. This trip is just the beginning. But for us, it will become a stepping stone, where we can continuously learn from the wisdom of Ciptagelar forests.